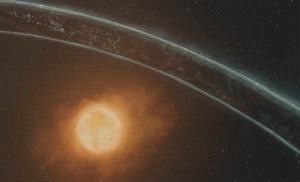 The Khaphrae system is the planetary system where Halo Installation 03 was located, centered around an orange star located in the Scutum-Centaurus Arm of the Milky Way galaxy. Before its departure from the system, the Halo ring orbited a shattered, rocky planet with a dense asteroid field nearby. Formerly part of the Forerunner ecumene, the Khaphrae system and Installation 03 were discovered by humanity in late 2552 when the freighter Floral Express, fleeing the Battle of Tribute, stumbled upon the system on a random slipspace trajectory dictated by the Cole Protocol. Upon learning of the discovery, the Office of Naval Intelligence quickly set up a presence in the system, establishing a research facility, Ivanoff Station, in an asteroid cluster near the Halo ring. On July 24, 2557, the Ur-Didact, pursued by Master Chief John-117, arrived in the Khaphrae system to acquire the Composer from Ivanoff Station. Shortly after, the Conduit was discovered on Gamma Halo. A battle between the UNSC and Jul 'Mdama's reformed Covenant faction and the latter's Promethean allies took place in the system over the artifact. The Covenant intended to use the Conduit to open slipspace portals for Prometheans to invade Gamma Halo and give themselves control over the installation. Ultimately, the Covenant forces were defeated and the UNSC remained in control of the Conduit. On July 25, 2557, following the Didact's defeat, John-117, joined by the rest of Blue Team, returned to the system to investigate Gamma Halo and entered a portal to the installation known as the Composer's Forge. There they learned the Ur-Didact had survived and was plotting another attack on Earth. At the request of the Didact, the monitor of the Forge, 859 Static Carillon, transported Installation 03 from the Khaphrae system to the planet housing the Composer's Forge. Following the Didact's seeming demise, Static Carillon did not return the ring to the Khaphrae system but instead took the Halo to an undisclosed location for safe hiding and repairs. Installation 03, located in the system. John-117 gazing upon Installation 03 and the star. The destroyed planet in the system that Installation 03 orbits.